With the third season of RIVERDALE less than a week away, the cast and creative team are at New York Comic Con to tease what’s to come. Follow along for our live-blog of the event! 10:10 AM: What’s a Cheryl Blossom pool party like? “A lot of skin!” Roberto Aguirre-Sacasa says with a laugh. 10:11 AM: The writers are working on an episode where the kids are prepping for the SATs; there will be a bit more school this year. “She has her head down as she’s trying to distract herself from that,” Lili Reinhart says of Betty trying to distract herself from her father’s killer ways. 10:14 AM: “There’s quite a few [mysteries] and Betty is always in the middle of them,” Reinhart says. The first mystery is an “epidemic” she teases. “One thing we missed a little bit in season 2 was Betty and Jughead as investigators,” Aguirre-Sacasa previews of the TRUE DETECTIVE-esque mystery ahead. 10:16 AM: “It was a little nerve-wracking,” Reinhart says of her reaction to the first episode, saying she had to be vulnerable. Amick teases there a number of cliffhangers, too. 10:17 AM: “I’m a lover not a fighter,” Luke Perry (Fred) says of having to punch Mark Consuelos (Hiram) in season 3. “He’s definitely now a full-on villain,” Aguirre-Sacasa says of Hiram. And there’s also a “Gargoyle King” who is torturing the kids. “He’ll grow up to be on the Supreme Court, one day,” Perry joked. 10:20 AM: “I don’t think it’s looking too good for Varchie this season,” Apa says. “For Bughead, so far so good,” Reinhart added. 10:21 AM: “She’s juggling a couple of relationships,” Amick says of Alice. She is drawn to Edgar Evernever, the leader of the farm. But Alice and FP are still hot and heavy. 10:22 AM: Gina Gershon has been cast as Jughead’s mother. 10:24 AM: Apa just showed off his Perry impersonation, which he will use more fully in the upcoming flashback episode. “I call him the scanner…in a short amount of time, KJ can walk like them, talk like them,” Perry said. 10:27 AM: “It’s sad, because you root for them to be on the same team,” Reinhart says of Betty’s relationship with her mother. But Amick points out that when push comes to shove, they’ll always be there for each other. “It was a really good look at a dynamic young men go through growing up,” Perry says. But that’s when you learn how much you actually picked up from your family, and as a parent, you also hope you laid enough foundation that they’ll do the right things. 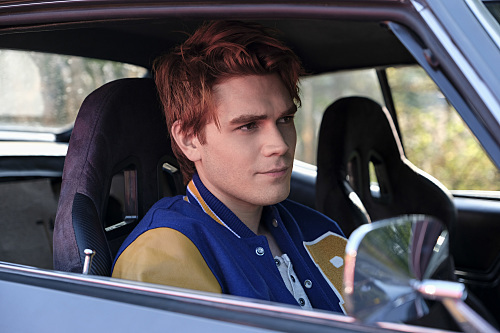 10:32 AM: “I think a lot of season 3 for Archie is making up for the stuff he did in season 2,” Aguirre-Sacasa says. He teases Perry and Apa just filmed a scene together that shows how much the characters have grown. 10:34 AM: Apa was convinced Sheriff Keller was the Black Hood. He asked a writer, who simply walked away…he thought he must be right. Reinhart and Amick say the craziest fan theories they heard was that their characters were the Black Hood. 10:38 AM: Aguirre-Sacasa says he tells Reinhart every year Betty will be happy. It doesn’t always happen, but this year there will be a little bit more fun with Jughead and Betty solving crimes. 10:42 AM: Reinhart says she loves seeing fan tweets, though she won’t be able to watch the premiere this week. 10:44 AM: “It’s not about the size, it’s the experience,” says of meeting fans at conventions. 10:45 AM: “There’s a very intense epiosde in this season, episode 7, that was physically demanding and emotionally demanding,” Reinhart teases. The first five episodes are tough for Apa. 10:50 AM: No, there will not be a SABRINA and RIVERDALE crossover any time soon. 10:53 AM: Could we see a very young Archie and Betty flashback? Maybe, Aguirre-Sacasa says. 10:54 AM: Apa asks if anyone here is from New Zealand. One fan says yes. He asks if anyone is from South Africa. Another fan says yes. Apa asks the SA fan how they liked being beaten by NZ. “No one was paying attention to [sports yesterday], because it was the day our Supreme Court died,” Perry says. 10:56 AM: We’re going to see FP bristling about not being the Serpent King and wanting to get back into the game again around episode 8 or 9, Aguirre-Sacasa says. 10:57 AM: And that’s a wrap!